Are you a nursery manager or childcare worker? Make sure you book your tickets to Childcare Expo 2017. We have a great range of workshops and seminars planned that are sure to fill you with ideas to take back to the classroom. It’s free to attend, and you will unleash a whole host of exciting opportunities. Childcare Expo in 2017 is an engaging and exciting event for childcare workers across the country. It is the one place where all the industry’s leading experts will be together to bring you the newest advice and resources in caring for early years children. With a multitude of informative seminars, practical workshops, and product stalls, you won’t know where to begin your day. Childcare Expo has been running for many years and has earned a place as one of the key events in the early years calendar. We are dedicated to providing a day full of inspiration and creativity that you can take and adapt to suit your own learning environment. We also believe that it is important to give people in the industry access to the latest products and information. If you are feeling low on inspiration, or want to gain more information on a new subject or teaching method, this is an event not to be missed. Everyone in the childcare industry is welcome to come along and most events are completely free. Whether you are based up North or down South, you have no excuse to skip the 2017 instalment of Childcare Expo as it takes place in both London and Manchester. From learning through play to getting children to appreciate the outdoors, there are plenty of opportunities to learn new and engaging teaching techniques at Childcare Expo 2017. You will learn the best new ways to deliver childcare and how to improve the development of the children in your class. We also have a great selection of exclusive competitions and offers for you to enter, so you won’t be going home empty handed! With the many exhibitors and fellow childcare workers we have visiting Childcare Expo in 2017, there will be plenty of networking opportunities that you will not get elsewhere. You can meet and chat with others in the industry to share ideas and teaching techniques, and even recommend your favourite workshop or seminar of the day. You may also get the chance to approach some of your childcare inspirations and ask for personal advice from the expert themselves. As well as multiple workshops and seminars, there will also be a number of stalls set up to showcase all different learning resources such as books and stationery. 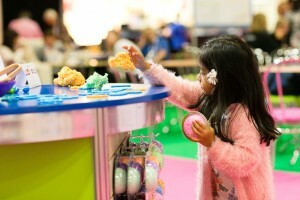 Industry guests are welcome to try out some of the childcare products before purchasing and get first-hand demonstrations from the suppliers. You can expect to receive discounts for high-quality products that you will not get from other suppliers or catalogues. If you have any questions about what’s going on at Childcare Expo 2017, feel free to call us on 01425 838393 or send an email to info@childcareexpo.co.uk. Alternatively, register here to get a ticket to your nearest event.